If the tail slaps of big rockfish can be compared to the rumble of a Chesapeake storm, I spent this past weekend riding on thunder road. 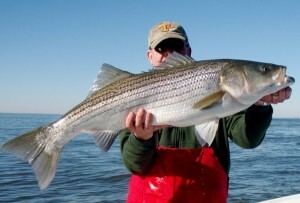 We’re seeing the first signs of spring on the Bay resulting in some fun fishing. The good times this weekend were especially sweet because I just took delivery of my new Judge 27CC. 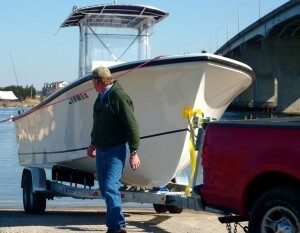 If you’ve followed my website you know I’ve been looking for a new boat for some time. There are several reasons why I chose the Judge. First off, I’m used to a long boat. Having fished out of the Sea Ray for three years, I wanted something of similar length and handling so I could continue to go out in rough weather. I also needed a boat with a relatively narrow beam so I can trailer to where the fish are without worrying about permits. My other priorities included a bass boat style casting platform, a place to duck in out of the weather or sleep in emergencies, a shallow draft for fishing the near-shore top-water spots, and a long comfortable warranty. Of course price played a major role. I narrowed my decision down to three brands and Bill Judge made me the best deal even after the modifications I needed. There’s a lot to be said for cutting out the middle-man and buying directly from the boat builder, especially when it’s a local Eastern Shore guy. I went with the 225 Honda after talking to as many people as I could about the engine. The deciding factor was high recommendations from some people I know who review boats for a living along with the advice from some of the guys who work for the DNR, the Coast Guard, and a tow boat company. I added a Lowrance HDS-8 GPS/sonar combo and tagged on the StructureScan unit because it’s so dern cool. The first fish-finder I ever saw was a Lowrance and I’ve never seen the need to look at anything else. I think they’re way ahead in the competitive field of sportsfishing sonar. The next order of business was to choose a name. We went around for a while on this one, but I gotta hand it to Daniel for coming up with the winner. Dianne christened “THUNDER ROAD” Sunday witha bottle of Natty Boh and a mason jar of Tennessee’s finest. Among other things, she’s named after Robert Mitchum’s song and movie about the area where I grew up. It’s also a tribute to my best friend who died last year. Curt and I did our share of passing around that mason jar while we were learning how to fish. I guess it’s no secret we never quit learning! 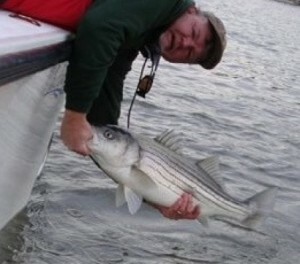 Now for the fishing report: It’s also no secret that the warm water discharges (WWDs) are rumbling with big stripers through the winter months. There are seven WWDs within reach of my home base here on Kent Island. I got out for a few hours at a time throughout the weekend with each day producing similar results. The fish are by no means easy to catch. I had to work hard for every bite. 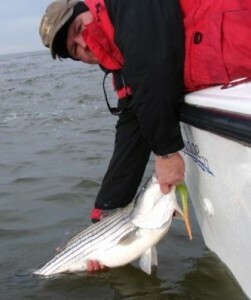 The biggest stripers were holding right on the bottom in the areas of highest current. The secret to catching them is to cast cross current and allow the lure to drift down, keeping a tight line and watching for slack, but never jigging until the lead touches the rocks. Once I feel the bottom, I snap up quickly, then follow the lure down with my rod tip staying alert for the next bounce. Just before the lure hits is usually when strikes occur. Strikes are subtile and easy to miss. The fish can spit the lure out and be gone before you even realize it. Sometimes, I only get two or three bottom touches before the lure is lost against the current and I have to reel in and cast again. The fish are very easily spooked, so it’s important to be sneaky. Stay as far away from the discharge as possible and cast in, talk softly, and be careful not to kick the bottom of the boat. 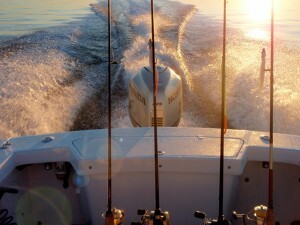 Never start or run the boat engine anywhere near the fish. My Honda 4 stroke is very quiet, but it will still put the fish on alert. No matter how quiet I am, I almost always get my biggest fish in the first thirty minutes after I arrive. Mature rockfish learn quickly. Best lures are ten inch Bass Kandy Delights in either chartreuse, white, or light purple that are hotrodded with orange or chartreuse garlic dye. There are some younger fish around that will take a smaller bait, but I don’t see the point of targeting them when there are trophies lurking. I’m only throwing two ounce jig heads with a candy corn pattern or my new “purple plunge” pattern. It will get easier as the weather warms, and extra efforts like alternating colors and unique scents won’t be necessary, but when the bite is tough, it’s important to use every advantage in your aresenal. 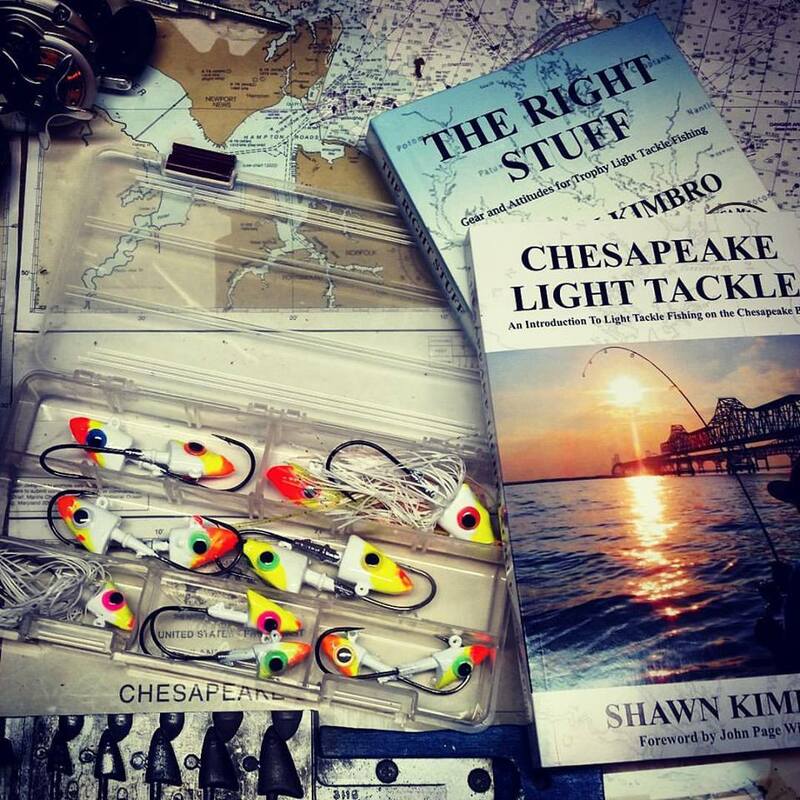 Hooking trophy stripers this time of year is the payoff for practicing jigging skills during the times when they’re more likely to bite. Since it’s catch and release season, most of my fish were caught on barbless hooks and released boat side so they were never taken out of the water. I couldn’t resist measuring one forty inch fish in my cradle net, then picking her up for a quick photo on my new boat. I hope to get out more this coming weekend and I also need to post a perch report. Please stay tuned! Saw Judge Yatchs listed as a sponser when I checked out the last report. Wondered what that was about so I checked the link. Looks like a fine boat from a reputable company. Best of luck with your “new ride”! And you couldn’t pick a better name. Oh yea, and those are some really nice fish too. Shawn – did you know that Robert Mitchum once owned a nice farm either in Q.A. or Caroline county where he came down to hunt? I am new to your site etc. 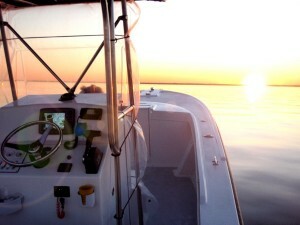 would I be correct to assume you and guide fishing charters? I would love to go out with you a day or two. great report and good to see that you survived the epic snows! Nice looking boat from Judge Yachts. I gotta figure that with that power on a narrow beam she will go when you need to? Question Shawn, will you be jigging on or around opening day when the hoards are out there manning the broomsticks? I had so much fun last fall attending LTJ University (as a freshman) I really want to get back to it! Would have splashed my boat this afternoon but the city of Annapolis left a snow pile at the Truxton Ramp: now that’s insult to injury! I believe Robert Mitchum had a farm in Trappe. Mitchum’s steakhouse in Trappe was named after him and they have a handout about the history of Trappe and Mitchum. Nice boat! I am so looking forward to the fishing season. Great info on Robert Mitchum. Ron — I am not a guide, although I hope to be someday. Scott — Yes, I sometimes jig on opening day. Almost everyone trolls. 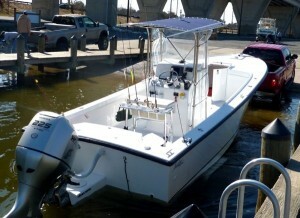 I may fish the Boatyard Bar & Grill tournament again this year. I’d like to put some more light tackle fish on the leader board. Looking forward to seeing Thunder Road around the BB this year and boy she sure is a nice looking boat. I wish you nothing but the best and I just know there will be many fish caught on her. Also it was good talking to you the other night and thanks for the Intel and I’ll let you know when that spot starts to heat up. Looks like Thunder Road will turn 1 year old next week. Yahoo! You goiing to the Judge Show Sat?